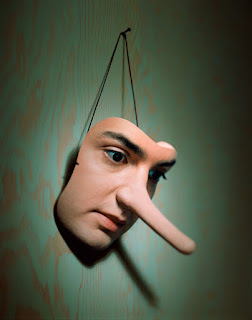 AS IT STANDS: Confessions of a Reformed Liar: Any of This Sound Familiar to You? Confessions of a Reformed Liar: Any of This Sound Familiar to You? Let's settle something right now...everyone lies at one time or another in their life. Show me a man, or woman, who claim to have never lied, and I'll show you a liar. A lie is a lie, no matter how you dress it up. I've known people who classify their lies (as if the very act somehow exonerates their action) into categories. Actually, I'm one of those people. Big fat lies. White lies. Little lies. Almost lies. The categories are as diverse as the people who use them to explain their reasons for lying. I'm pretty sure the first time I lied was to save my hide from a spanking by blaming my brother for something bad, dangerous, or something just plain stupid, that I did. I catagorize that tactic as the survival lie. As I grew older and became interested in girls, I lied about my sexual experiences even though I was a virgin. I categorize that lie as the cool lie, and strongly suspect most of my friends used it too. When I was a teenager, I lied about my age all the time. Whether it was to impress a girl, or get inside a theatre showing Adults Only movies, I claimed to be 21 when I was as young as 16. I categorize those lies as casual lies. When I was in my 20s I lied about my experience to get jobs. I was in my early 50's before I finally quit lying about things. It wasn't easy. Telling the truth never is, despite the claims of some authors. It's a big relief not to have to remember cover-up lies or other daily lies anymore. I've run out of reasons for lying. Now, for better or worse, I tell the truth in all things. FYI: Not everyone wants to hear the truth!